Fun meets function when describing the endless creative possibilities with Doodlebug’s Daily Doodle calendar pages! Whether it’s daily documentation or remembering a special occasion, you will love using the calendar pages as the design foundation. Mix cheerful pattern papers, cute icons stickers and ephemera to create a fabulous page which can be proudly displayed on a 12×12 clipboard (included in your workshop kit)! When you register, please specify the clipboard colour of your choice (swimming pool blue, bubblegum pink, or limeade green). 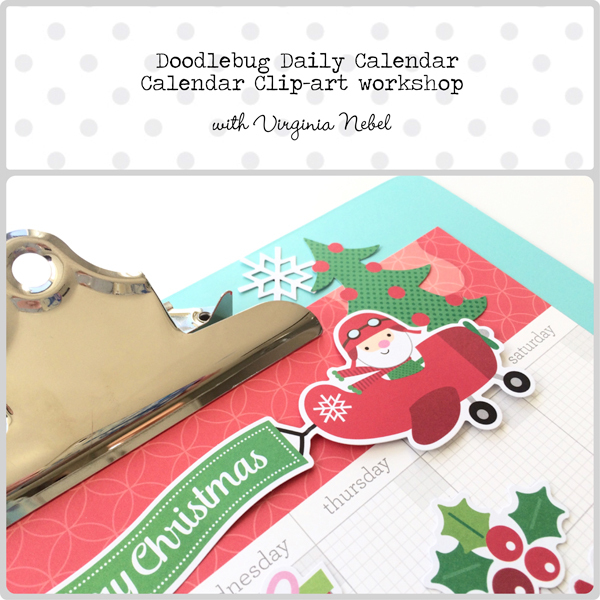 In this workshop, Virginia will guide you through the completion of 3 calendar pages with a holiday theme plus other celebratory themes (tbd later). As a bonus, you will also receive design and instructions to make cute cards with the supplies leftover in your workshop kit. Please note finished projects may differ from the sample shown.